Smartphones are very personal -- one device cannot fit all. Some people love the "phablet" craze, declaring enormous devices such as the Galaxy Note 3 as the best. However, others will say it is too big. Even more will decry the fact that it runs Android and not their favorite mobile OS of choice, such as iOS or Windows Phone. So in reality, if a reviewer says something is the best, or perfect, it is the best or perfect for them. For you, maybe it would be a poor choice. But, if you do prefer Android, the nice thing is, those devices come in many shapes and sizes, so you can make your own choice. With all of that said, for me, the HTC One M8 is the best Android phone available and it is damn-near perfect, save for a few minor gripes. Do you agree with me? First things first, I am one of those people who think the Galaxy Note 3 is just too big. Truth be told, I find a 4.7-inch screen to be the sweet spot. The Moto X is a perfect example. The HTC One (M8) exceeds this quite a bit, but still fits perfectly in my hand. The bigger size is not only because of the larger screen, but also the large top and bottom bezels, which make it is very tall. The large top and bottom bezels are worth it though, as they house the best smartphone speakers that I have ever encountered. You see, when holding the device in landscape, you get an impressive stereo sound experience. Both music and movies are exceptional and even something as simple as watching YouTube is greatly enhanced on the M8. While the sound is wonderful, the screen is equally impressive at 1080p. With a mind-blowing 441 pixels-per-inch, both pictures and video pop and feel almost life-like. You will need a magnifying glass just to see a pixel -- it is that good. It is so good, that i must laugh at the people who at one point said 1080p is a waste on a small screen. The ocular nirvana created by the M8 is second to none and puts Apple's lauded "Retina" to shame. You can even wake the device by tapping on or swiping the screen. Much has been made about the M8's 4 megapixel camera. Many people equate such a "low" amount of megapixels to equate to poor quality. Of course, this is not at all true. Without going too much into detail, there is more to quality photographs, such as sensor size, lens quality and more. I am happy to say that the M8 captures amazing photos. The dual-rear cameras allow some amazing focus effects to be enabled, which really creates a fun experience. Rather than just use cheesy filters and generic effects, having double the optics provides the ability to truly enhance the photos in post, with impressive focusing and faux-3D. Also included is a dual flash, for great photos in low lighting. Video recording is also wonderful, but only 1080p. Now, I know what you are thinking, only 1080p? For the most part, you are correct, 1080p is good enough. But, for a phone that pushes to be better than "good enough", I would have liked to see 4K recording as an option. While 4K televisions are still rare in most homes, it would have been good for future-proofing. Even YouTube supports 4K, so it would have been neat. Deal breaker? No, not in the slightest. Again, the 1080p video that it captures is beautiful and would be perfect for your family memories. Button placement is very good and I like the feel of the volume rocker. The power button is on top and flush, which makes it hard to accidentally press. The headphone jack and MicroUSB ports are found on the bottom. The device also has a SIM card slot and a microSD slot.While I am a huge proponent of streaming music services, the ability to add a 64GB card full of music and movies still appeals to me for long trips or long periods in areas with bad coverage. One of the big selling points of the M8 is the build quality. The chassis is all aluminum and I must confess that upon removing the phone from the box, it was so impressive, that I had to smile. I sat there for a moment with a big grin, just rubbing my fingers along the cold metal body. Now, I am not averse to plastic; quite the contrary. But, it is very apparent that the designers cared about the product. Engineering and thought went into crafting the art. Yes, it is art. With so much thought going into the device, it is a shame that such a crucial feature is excluded. Which feature you ask? Qi charging. Wireless charging is such a wonderful convenience, that it is an absolute shame that it is not found here. Devices such as the Verizon LG G2, Nokia Lumia Icon and Nexus 7 all support the standard. If you aren't familiar, it allows you to charge your device by simply setting it down on a compatible charging plate. Before you say I am just being lazy, let me explain why this feature is so important to me. I absolutely hate the microUSB charging standard as you must fumble with the cable, and fiddle with plugging it in correctly. Over time, the port can get damages and full of dust and lint. This is particularly troubling on the M8, as the bottom is aluminum and I fear it will get scratched over time. With all of that said, it likely cannot be done due to the aluminum chassis. So, it is a trade-off. Quite frankly, if I had to choose between the aluminum chassis and Qi wireless charging, I am choosing the chassis. Speaking of the battery, while the 2600 mAh is not class-leading, it is still passable. Other phones such as the Droid Maxx and LG G2 offer better battery life, but the M8 holds its own. I can easily get through an entire day with heavy use. Of course, marathon sessions of Netflix streaming will kill it quicker. What is really impressive though, is how fast it charges. The Snapdragon 801 offers Quick Charge 2.0, which promises 75-percent faster charging and I can attest to it. Wireless connectivity is pretty epic, as the phone supports many cellular bands. This makes it great for a world traveller. Homebodies can get excited too though, as the phone supports 802.11 a/b/g/n/ac on both 2.4GHz and 5GHz -- yes, dual-band and AC! When connected to my Apple Airport Extreme, speeds were absolutely blazing. Of course, as great as the build quality is, you will likely be stuffing the phone into a protective case anyway. So, does it even matter? I say yes; quality is quality. I recall reading about the infamous Steve Jobs and how he wanted the inside of a computer chassis to be attractive, even though most consumers would never even see it. For Jobs, It was important to the overall quality for things to be perfect. I recall that to say, even if people you encounter don't know the beauty of the M8 while in a case, the engineers that designed it do and most importantly you do. 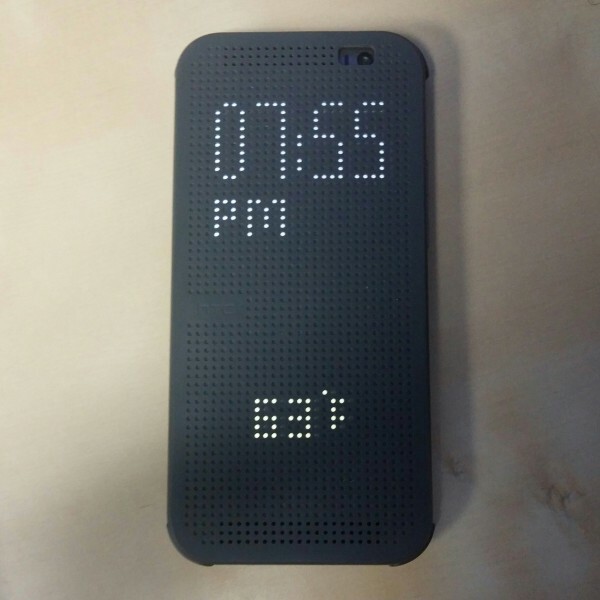 Speaking of cases, there is a rather interesting one available for the M8, called the Dot View Case. At first glance, it is rather ordinary. The back is plastic and the phone snaps into it. Attached on the side is a cover for the screen. Now, this cover is full of little dots which is rather out of the ordinary. When the cover is closed against the screen, it activates a special on-screen display, which shines through the holes. It shows the time, the weather, the temperature and if you missed a call. It even displays the volume levels as you adjust them. You can even interact through it using touch. The case has a vert nostalgic, old-school feel as it brings back memories of the Lite-Brite children's toy and is fun at first. However, for me, the gimmick wore off rather quickly and I started to dislike the case. It functioned great, but the negatives became an annoyance. For one, the dots are little craters that fill up with dirt and sweat. After a while, the thing can get a bit grimy -- it may be a huge germ magnet. Also, the screen cover has a lot of bounce in it, so when folded around the back and laying on a table, the device does not lay flat, but instead at a slight angle. While using it in this position, the phone bounces, as if on a spring, which becomes tedious. I highly recommend trying the case before you buy it. You may be able to put up with my perceived issues. There has been much debate about stock Android and how tweaked interfaces such as Sense, TouchWiz and Blur are horrible. I disagree with that sentiment quite a bit actually. While stock Android is nice, some of the manufacturer tweaks really enhance the experience. Sense is particularly good as it is not intrusive at all. The most notable feature is called BlinkFeed. This is a social media aggregation service. In other words, it pulls in data from Facebook, Twitter and google Plus and shows it in a single feed. It works very well and is easily accessed by swiping right on the homescreen. Also great is the "Recent Apps" feature. HTC has nailed it so well, that I hope Google copies it for the stock experience. Rather than scroll through a listing of apps, Sense maximizes the screen real estate and shows them as cards on the same page. You can then swipe them up to close. I very much like the way Sense handles folders too. If I want to add multiple apps to the folder, I can just click the plus sign and select all the apps to add. On stock Android, you must drag and drop one at a time -- tedious! Need more storage? Get 25GB to 50GB free additional Google Drive depending on the device you purchase. These are huge wins for anyone that purchases an M8. Cracked screens are a plague on the smartphone community and there is a good chance that M8 owners won't use a case, so they can show off the beauty. And so, a free screen replacement is totally awesome on HTC's part. A commitment to updates mean that you won't be stranded on 4.2.2 forever. The Google Drive upgrade works as advertised. When logging into the Drive Android app, I was welcomed to an additional 50GB --score! While BetaNews would never suggest performing any hackery on the device, it is a fact of life that many Android users like to tinker. Well, those enthusiasts will not be disappointed, as the M8 has been blown wide open. You see, by default, HTC ships the devices with a security check called "S-On", which enables hardware write protection. From a security standpoint, its a good feature, but for hacking enthusiasts, it is a roadblock. Thankfully, the Android community has managed to disable it. On top of that, the bootloader has been unlocked, root has been achieved and custom recoveries have been released. What all of this means is, custom ROMs are soon to flood Android forums everywhere. In fact, I flashed a brand-new custom ROM today, called "Skyfall". 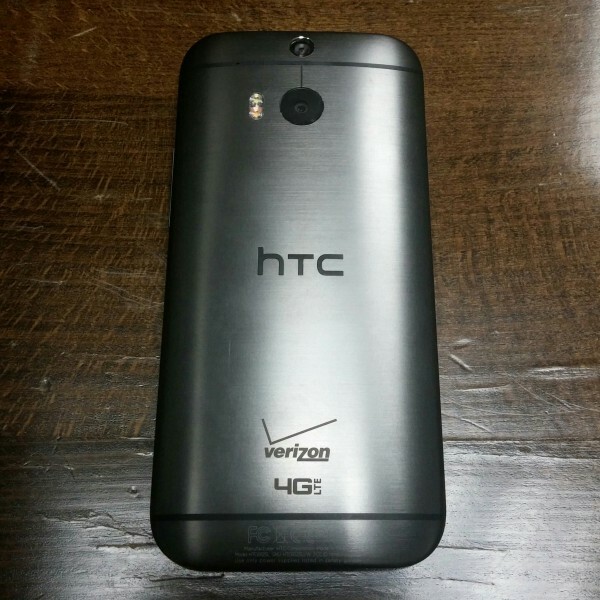 This ROM does cool stuff, such as remove the Verizon bloatware and boot animation. If tinkering is your thing, this is where it's at! 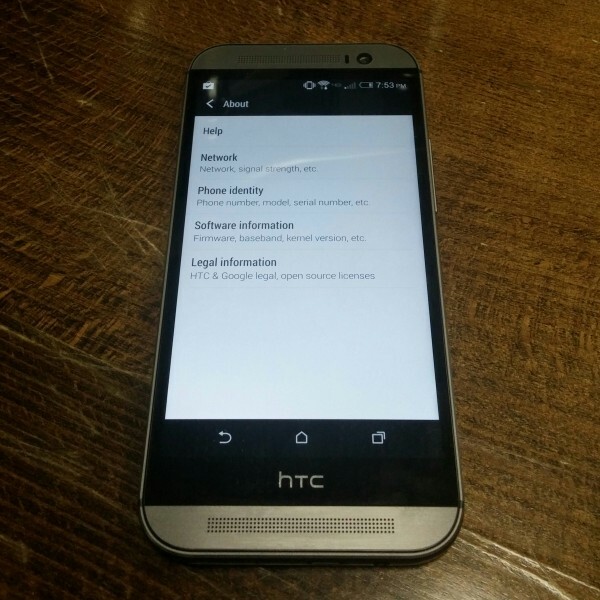 New ground has not been broken with the HTC M8. There is nothing revolutionary; only evolutionary. There is no fingerprint reader, silly stylus, heart-rate monitor or waterproofing. However, there are no gimmicks either. HTC has delivered a close-to-pure Android experience with some clever Sense tweaks here and there. Overall it is just a great, well-designed phone. If you are an Android fan, with a penchant for quality hardware, this is the phone to buy. Hell, let's not forget that it is very hack-friendly too. Even without Qi wireless charging or 4K video recording, the HTC One M8 is the best Android phone available. Highly recommended.